Of course, standing up and admitting that my words are flat and too few isn’t enough. 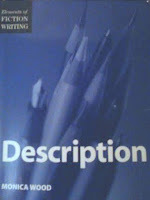 That’s why one of my goals for 2013 is to learn more about and improve my use of description in my novels. I find Writer’s Digest Books to be a solid and reliable resource, especially their “Elements of Fiction” series. WDs “Description” by Monica Wood is just what I need right now. I haven’t read and studied the whole book yet, but Chapter Three jumped off the Table of Contents page and landed in my lap. I know that description is a very important ingredient when crafting a good novel. Description, used well, transports the reader into a fictional world they can completely see and feel, maybe even taste and smell. Wow. I need to be able to do that without leaving the reader in the dark or forcing them to stumble over large chunks of contrived data much like a chocolate cupcakes smothered in sugary, red dye number three frosting. Chapter Three, “Description and Forward Motion,” caused me to look at adding the details in a different light. I hadn’t associated description with ways to move the story along. How about you? Monica Wood says, “Forward movement in fiction is twofold: physical and emotional. Physical movement is the movement of the plot from beginning to end.” And adds, “The other kind of forward movement, emotional movement, follows the character rather than the plot.” So, how does description help with all this? Here’s an example: A woman in the depths of despair begins her morning in slow motion, in a cold, bare room staring at a cracked window as she waits for the bleak sun to rise. Her door opens, and the smell of fresh coffee fills her room. He pulls a wooden chair beside her bed, takes her cold hand in his, tells her all the tests are negative. The warmth of his touch sends a tingle up her arm, as hope flows through her again. It’s time to go home. Wood reminds us, “You don’t want your story to move at the same rate from start to finish. A story’s pace is controlled by the physical and emotional goings-on in the story, and those goings-on are controlled by description.” I’ll definitely spend some time with “Description” by Monica Wood. What books on writing are helping you start your 2013 writing year?